Still looking for the best remote home monitoring system to help you keep an eye on your household from anywhere? They come in various shapes and sizes, and with the seemingly endless features that come with each of them, deciding which one suits your home best can be a pretty daunting task! Small Wi-Fi home security cameras (also called IP cameras) have dominated the market in 2016. These types of camera systems allow you to stream video to your smartphone, tablet or desktop computer; and will even send you notifications if they detect motion. The best ones also feature night vision and automated motion-activated recording. Here at HomeSecurityList, we love doing the work to help you find the best of the best. And today, we’re going to reveal the 10 best remote home monitoring systems that you can buy this 2017. The information in this guide are all you need to find the perfect security camera to keep your home, your family, and your assets safer. What you are about to see is a list of remote home monitoring systems that are best for monitoring multiple rooms and angles in your home. With these, you can keep track of what’s happening throughout your abode, store video recordings on the cloud, or on a local SD card. Choose one or combine some of them to create a powerful indoor or outdoor system that can effectively watch over your home remotely. 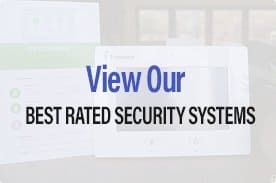 We evaluate these security cameras not just based on their popularity but also on their pricing, design, setup process, set of features, and overall value. Design wise, we take note of the security camera’s aesthetic value, particularly its size compared to other cameras of the same type. In terms of setup process, we deduct points if a camera takes time to set up or is often reported by actual customers to have a confusing setup process. We also dock point if the system lacks essential features which are otherwise offered by the competition. This, however, can be counterbalanced if the system provides other unique or useful features. As for a system’s mobile app, we rate it based on the intuitiveness of the interface, as well as its reliability. We also rate field of view and resolution, the quality of remote viewing, as well as the quality of the video recording. Apart from these, we also determine whether or not a camera offers cloud storage for recordings. Although some companies charge a certain amount for cloud storage, this feature allows you to access recordings without the hassle of removing an SD card from the camera system and inserting it into a PC using an adapter. And as with anything that uses local storage, you’ll run the risk of losing your recorded videos if your camera itself is stolen. With that said, cloud storage is not only more convenient, but safer as well. A home security system that costs too much doesn’t really serve its purpose of protecting your assets. Remember that cost is an important factor for every buying decision you make. This is especially true for security systems that are meant to protect your valuables. Make sure that the security system has Wi-Fi capability so you can communicate with your home network wirelessly. Unless your home is already prewired for a home monitoring system, a Wi-Fi enabled security camera is much easier to install since you won’t have to go into the trouble of setting up cable wires and drilling holes into your wall. What’s more, it’s less susceptible to being disarmed or destroyed by burglars since it doesn’t have wires which could be cut. This refers to a security camera’s ability to record video based on the width of area. This will help you decide the number of cameras you need to install and where you should place them in your home. The wider the field of vision, the less cameras you need. A camera that has the ability to pan and/or tilt allows you to record a much larger area compared to a static camera. Just like the field of view, this feature can help reduce the total number of cameras you need to install in your home. Resolution refers to the clarity of the image recorded from the camera. A crisp and clear image is very important when trying to identify items and faces in recordings. The distance to which a camera records images or videos in low-light situations has a huge impact on its effectiveness, especially when criminal activities are often committed at night. 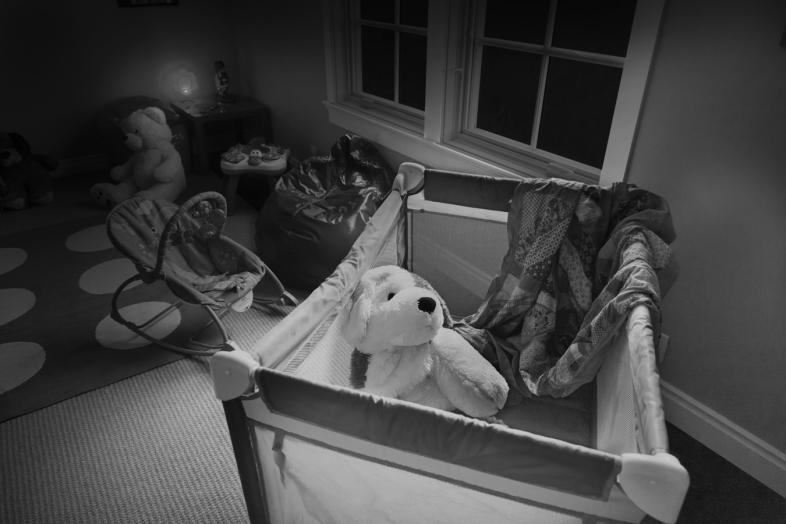 Make sure a camera has an infrared night vision feature that could help capture images even in the dark. Although not readily available in many remote home monitoring systems, a camera with this feature can receive sound, usually via a microphone, emitting sound through a speaker, or both. Security systems that can do both can also be used as an intercom. Before anything else, you need to know that remote home monitoring systems can be broken down into two groups: Indoor cameras and outdoor cameras. And while there are varying styles for these two types of security cameras, the differences will become more apparent once you compare their features, so there’s no need to separate them further. Both types of security cameras can be purchased as standalone units, complete with either a monitoring app or a subscription-based monitoring system. 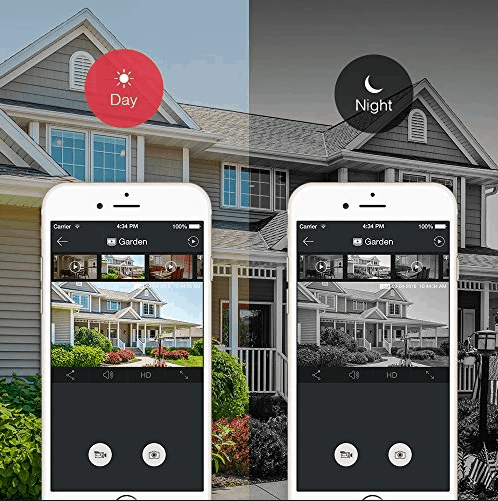 With the help of this guide, you can make a sound buying decision by comparing 10 of the best-selling indoor and outdoor home security cameras in the market, as seen below. The first remote home monitoring system in our list is the ever-popular Nest Cam Indoor Security Camera. Although it’s one of the more expensive standalone units in the list, this security camera graces our spotlight for its high resolution and seamless integration with Nest Cam’s home automation system. Nest Cam helps you look after your home 24/7. Get alerts if something happens. And watch the action live in super clear 1080p HD. 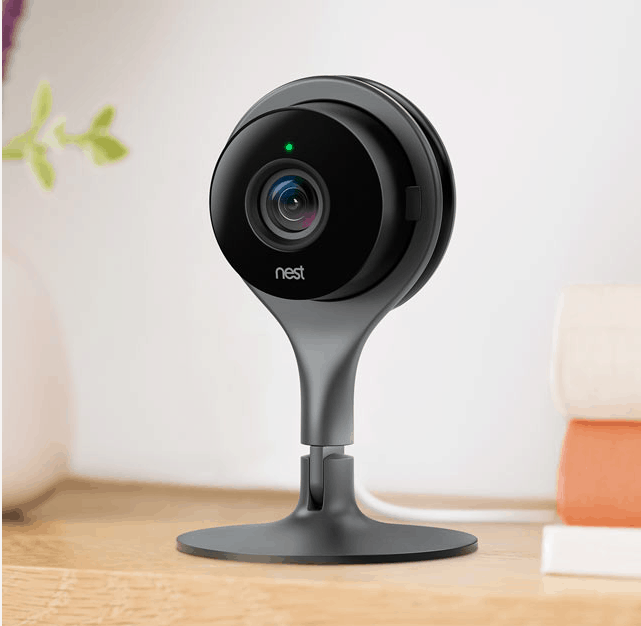 Nest Cam belongs to the third generation of the highly celebrated Dropcam and to be perfectly honest, it beats its predecessor with its amazing 1080p video resolution. Their full HD live video and recorded footage is one of the best we’ve seen so far. The crisp and clear video quality will put most security cameras we’ve reviewed to shame! Even when you’re not around to see what’s going on at home, you can still do round-the-clock live streaming with the Nest Cam Indoor Security Camera. It has an extremely versatile magnetic, swiveling stand that allows you to put the camera anywhere inside your home, thus making installation simple and easy. Just plug in the camera, download the Nest App, and you’re all set – no batteries or hub required! Sadly, the camera doesn’t have any pan or tilt capabilities, but the enormous 130° wide-angle view and all-glass lens compensate for this, allowing you to monitor your home in glorious HD, day and night. The camera also didn’t disappoint with its night vision feature, as it allows you to see an entire room at night and not just a limited spotlight view. Night vision mode is just as impressive as the regular mode where it’s easy to pick up on important details in a room, as well as a person’s features. And if that’s not enough, the Nest Cam Indoor Security Camera can also serve as an intercom since it comes built with a microphone and speaker, allowing you to talk and listen using the app. You can use this two-way talk capability to speak up to get someone’s attention – even telling your pets to get off the couch! The Nest Cam Indoor Security Camera has an impressive motion detection feature. The camera comes with a free Nest Aware trial, a program that sends you intelligent alerts and continuous cloud recording, up to 10 or 30 days. When the camera detects activity, it will send an alert via phone or email, along with a snapshot of the event. We put a test to this feature and we indeed received prompt motion alerts which are sent in 30-minute increments. 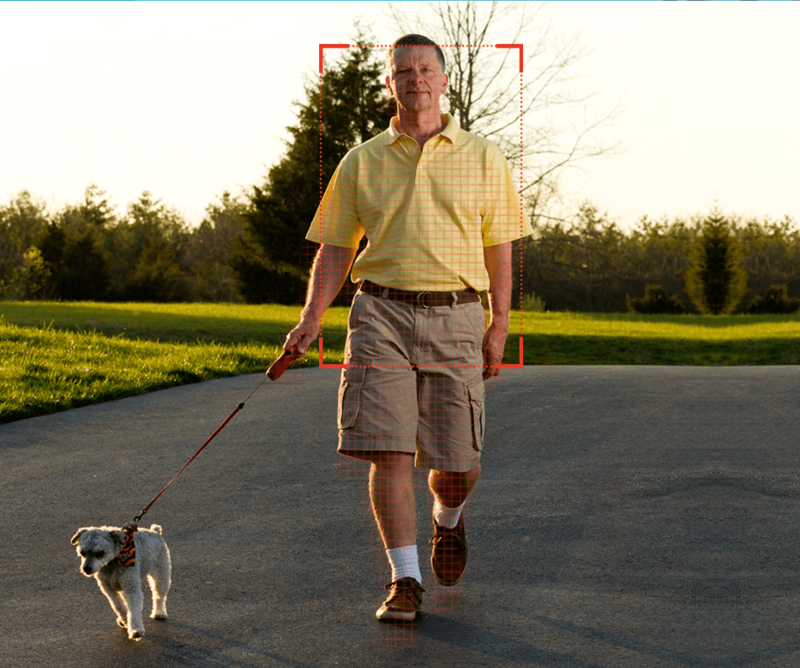 For more accurate and timely alerts, the camera also has the so-called Activity Zones feature that allows you to target specific areas in your home. Alerts work perfectly well for this feature as well. You can easily speed through video recordings in seconds and immediately find the moment you’re looking for with the Sightline feature. You can even share custom clips and time lapses whenever necessary. Our only major concern with Nest Cam’s motion detection feature is the duration between alerts. Assuming that it’s been at least 30 minutes since you received a notification, any person could walk in front of the camera and trigger a motion alert, except that you won’t be receiving it until the next half hour. So if someone breaks into your home during this period, you wouldn’t receive the notification in time to catch the culprit. This places Nest Cam in a pretty tight spot. Add to that the fact that it doesn’t offer the best value for cloud recording compared with some other products in the same budget spectrum. To unleash the camera’s full potential, you may have to shell out an extra $10 or more per month and get the full version of Nest Aware. The Nest Cam Indoor Security Camera can now integrate with other third-party applications and services like the IFTTT Nest. And with the Nest Cam Home Automation Suite, you can link it to the Nest Thermostat and Nest Protect smoke detector. Simply link the camera via the Nest app’s Home & Away feature and it will automatically turn on when you set the Nest Thermostat to Away and off when you set it to Home. It’s a highly responsive feature that works all the time. 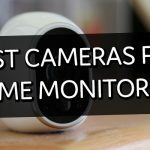 The second spot in our list of the best remote home monitoring systems this 2018 still belongs to Nest Cam – this time with their amazing outdoor security camera. 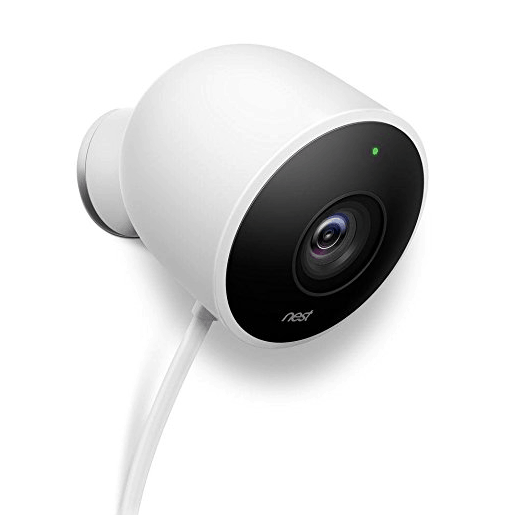 It builds upon its indoor counterpart: the glorious 1080p video resolution, the 130° wide-angle field of view, night vision function, two-way talk capability, access to the Nest app and a trial for the Nest Aware program, and the high-quality image and sound. The main difference between the two is that the Nest Cam Outdoor Security Camera has a more robust design and is built to be weatherproof, rain or shine. And unlike the indoor camera, it needs to be placed near a power outlet, since it comes with a power cable and adapter. This outdoor camera is relatively easy to set up. Simply plug it in, mount the camera, and start recording. And just like the Nest Cam Indoor Security Camera, you can stick it to a magnetic surface so you can save yourself from drilling holes to your wall. You can place it over the front door so you can monitor who comes and goes, or mount it outside of your garage so you can keep a close watch on the driveway. For a much wider coverage, consider installing it to a steel rain gutter using the magnetic mount. Whatever your choice, this security camera will have you covered. It doesn’t require batteries and as long as you have Wi-Fi connection, you can remotely monitor your home 24/7 using the handy Nest mobile app. So what could be the possible setbacks for this product? It’s the same with the Nest Cam Indoor Security Camera in that it can be pretty expensive compared to the competition, and you need to unlock its full potential by subscribing to the versatile yet costly cloud storage plan. Netgear is better known for their top-of-the-line networking equipment like Wi-Fi routers, but did you know that they also cater to home security solutions? 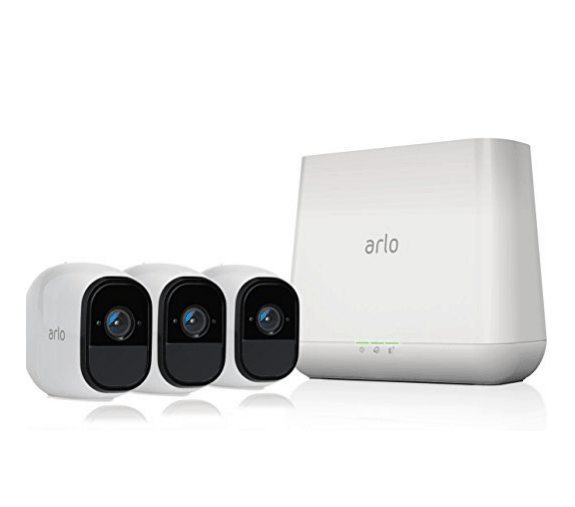 Gracing the third spot in our list is none other than the Netgear Arlo Security System. This smart remote home monitoring system can be used both as an indoor and outdoor IP camera. Compared to the Nest Cam cameras, it has a lower resolution at 720p. This, however, still assures you with stunning HD details on captured images and video recordings. You can conveniently and securely view live stream or recorded videos from your mobile device or PC using Arlo’s free app. If you’re using the iOS or Android app, you’ll get up to 1GB of secure cloud storage, plus you can watch up to 4 video streams at the same time. What makes this camera such a best-seller is its patented 100% wire-free design, making installation and placement a breeze. The package includes rechargeable lithium batteries, so you won’t have to bother buying new ones each time the batteries drain out. And just like Nest Cam, it comes with a unique magnetic mount that lets you discreetly place the camera wherever you want and monitor your home from every angle possible. The system is also expandable, with support for up to 5 cameras for the basic plan. Upgrade your plan, however, and you can install as many as 15 cameras! 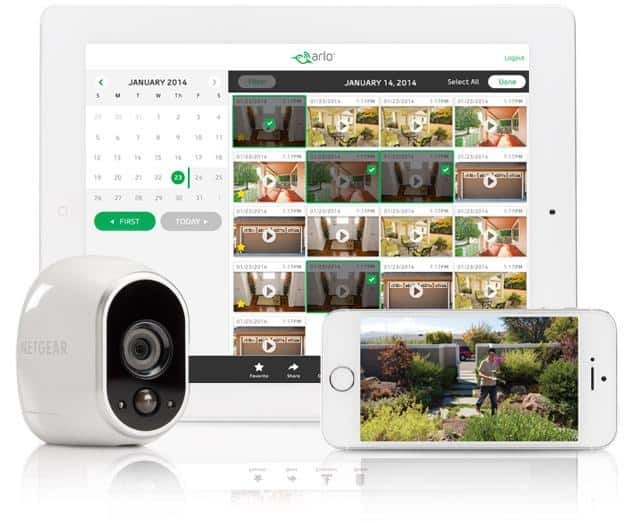 Since you can also use it as an outdoor camera, the Netgear Arlo Security System boasts a robust and compact design that’s built to be weatherproof, even in harsh conditions. With its integrated infrared night vision feature, you can make it work even in the dark. Whether it’s day or night, rest assured that this little camera can keep an eye on everything in crisp and clear HD. What’s more, the camera has a motion detection feature that records and sends alerts when it detects movement. The best area for this camera’s motion detection is 5 to 20 feet from the camera’s position. It has a 110° wide-angle field of view, which is slightly lower compared to Nest Cam but nevertheless has impressive coverage. 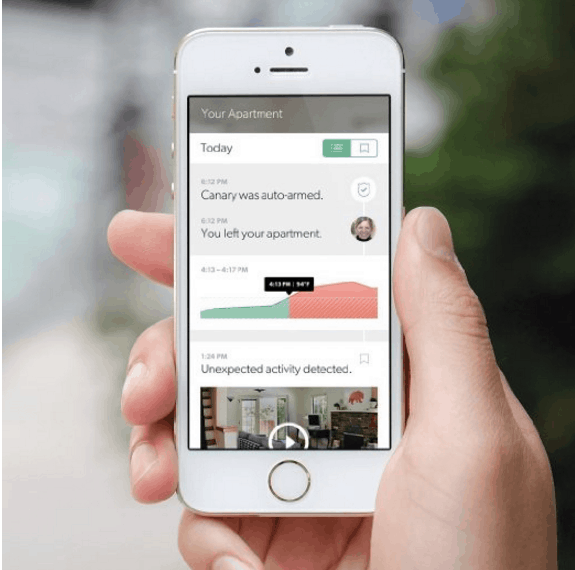 Capture clips and customize activity alerts to provide you with real-time email or app notifications. One particular area where Netgear Arlo excels is that it comes with free cloud storage. 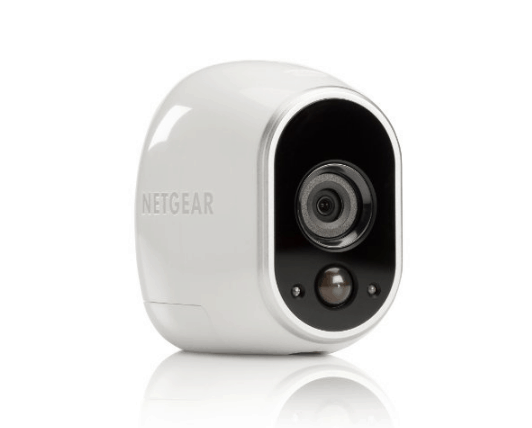 In fact, in this guide, Netgear Arlo is one of only two remote home monitoring systems that offer free storage options. With this security camera, it’s less about storage and more about the number of clips you can store. The system lets you store motion-triggered recordings up to 7 days. The free cloud storage is included in the Arlo Basic Plan, which, by the way, never expires! It’s only when you need more storage space and service levels that you’ll have to upgrade to a high-tier plan, which comes at an extra cost. D-Link is yet another company that’s better known for their cutting-edge networking equipment. But just like Netgear, they’ve also ventured into digital home solutions, specifically remote home monitoring systems. The D-Link Day & Night Wi-Fi Camera with Remote Viewing (DCS-932L) has been a best-seller in 2016 and continues to be a top favorite among homeowners in 2018. With its relatively low resolution (480i) and narrow field of view (a very low 46° wide angle), you’re probably wondering why a lot of customers love this little camera, but get past that and you’ll see it actually has a lot going for it. 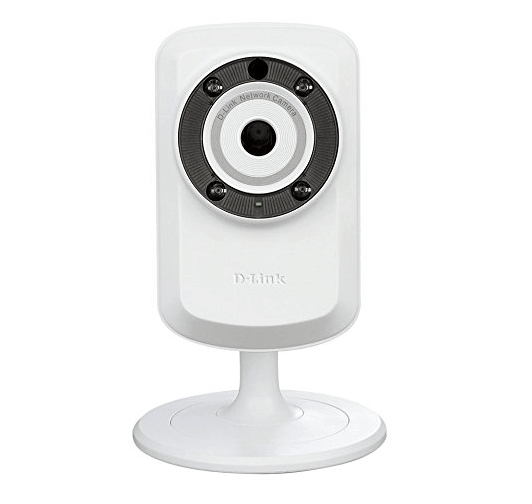 With its sleek and compact design, the DCS-932L model can both be a wired and wireless indoor security camera. You can easily and securely connect it to a Wi-Fi or Ethernet cable, giving it a much more flexible placement. Use the mydlink Lite app for viewing live stream or recordings on your iPhone, iPad, Android, or Windows device, even while you’re away home. You can also use the app to control and pinch to zoom the camera up to four times. And with the mydlink Camera Recorder (DNR-202L), you can simultaneously stream, record, and playback up to 4 D-Link cameras. This also provides a scalable solution for recording and storing images and video clips. With the D-Link Day & Night Wi-Fi Camera’s motion and sound detection technology, you can get smart alerts for when movement or loud noises are detected. Push notifications will be sent to your phone or email so you’ll know as it happens. The camera also assures you with 24/7 surveillance as it comes with built-in infrared LEDs for night vision capability that allows you to see up to 16 feet (5 meters) illumination distance, even in complete darkness. Unfortunately, the D-Link Day & Night Wi-Fi Camera doesn’t offer cloud storage, which means recordings are stored locally. Depending on your chosen plan, it can come packed with a built-in microSD card slot that supports up to 32GB capacity for recording and storing snapshots and video clips based on motion and sound triggers, schedules, or if you wish to record continuously. 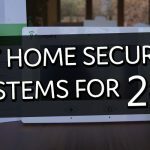 What’s particularly appealing about this remote home monitoring system is that, unlike Nest Cam and Netgear cameras, there are no excessive monthly monitoring fees or contracts to speak of, so it’s definitely a good choice for those who want a reliable home security solution that won’t break the bank. There are no activation or early termination fees, and there are no automatic renewals (hence, no surprise commitments!). Once you buy it, you own all of the equipment! Foscam may be under the radar for some people but for those who have their Foscam R2 1080P HD Wireless Security Camera, it quickly became one of their favorites, despite some kinks that need to be worked out. The Foscam R2 has an ultra slim design that makes it sleek and inconspicuous in your home, whether you mount it on your wall, shelf, or table. In fact, the body of the camera is about 20% smaller compared to leading models. Strangely enough, it will remind you of R2D2 from Star Wars, not just because it has R2 in its name but because the shape of the camera really does look like the iconic robot. Setting it up is easy. It has both Wi-Fi and wired connectivity (via Ethernet port). Simply plug the camera in the included AC adapter and into a power outlet, wait for it to boot up, and you’re all set. Finally, we get to see a camera that can rotate both horizontally and vertically. The impressive pan-tilt-zoom (PTZ) control alone will make you want to consider choosing it over any other wireless IP camera that are currently in the market. 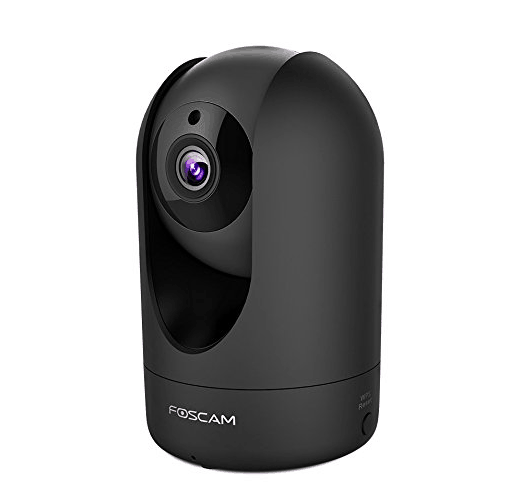 The Foscam R2 features a rotating camera lens with superior video quality of 1080p FHD. The camera also boasts a 110° wide-angle field of view and 13 infrared LEDs for crisp and clear night vision up to 26 feet. And with the Advanced WDR feature, the camera will automatically correct dark faces even under strong or heavy lighting. 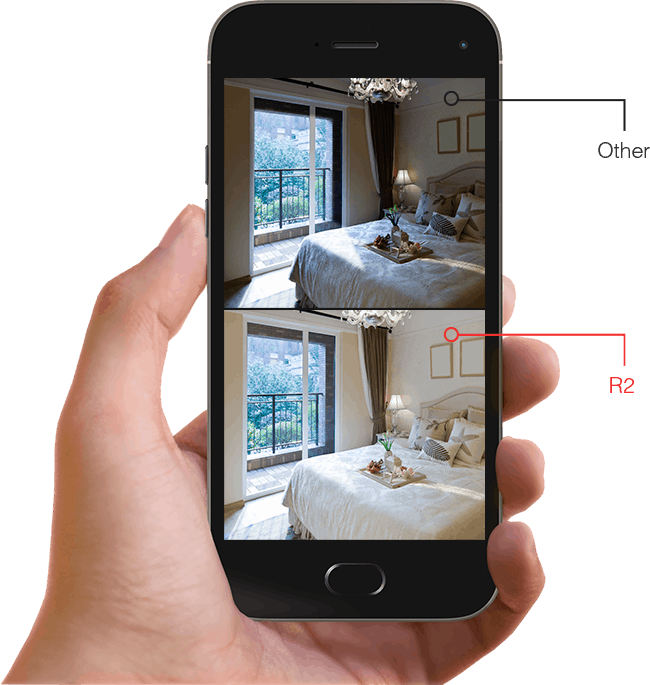 With help of the handy Foscam app for iOS and Android, you can enjoy simple plug-and-play setup where you can remotely access your security camera feed, recordings, and motion events even when you’re away from home. The app also allows you to manually capture snapshots and record video, which can be locally stored to the microSD card (not included in the package). It’s a pretty good mobile app, but some customers have reported that it’s not as reliable as other apps, like the Nest app. For example, some users kept missing notifications which is a crucial factor in a security camera. This doesn’t happen with apps like Nest Cam’s. And then there’s Foscam R2’s smart motion detection and alert functions. The camera will be triggered once it detects movement and with the Rich Media Message Push feature, the system will provide real-time push notifications with captured images, via your smartphone. You don’t even have to sacrifice the camera’s versatility and with its PTZ control, you can follow and record the action as it happens, when a motion alert has been triggered. This way, you can keep track of an intruder’s movements, even if they’re placed outside of the camera’s wide stationary field of view. Just like most best-sellers, the Foscam R2 has an enhanced two-way audio feature and is built with high-quality integrated mic and speaker that reduce background noise and improve audio output. You can use this as an intercom so you won’t have to waste money buying a separate one. Finally, there’s cloud storage. The good news is that apart from local SD storage, Foscam also offers secure cloud access over the web. A free 30-day trial of their Foscam Cloud is included with the package and you can use it to easily scan cloud footages, find and download any recording you need, and most importantly, store data offsite. This protects you against any footage loss caused by theft or damage. 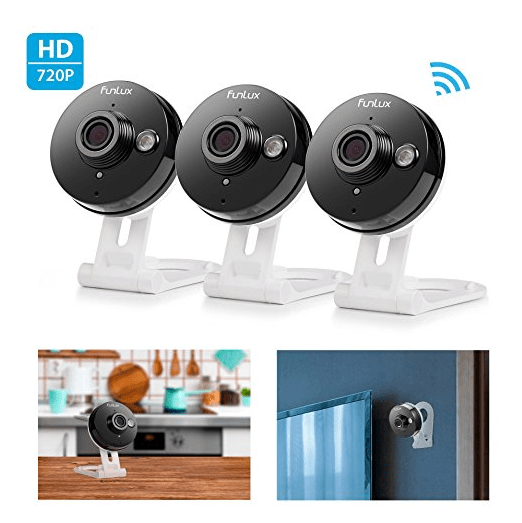 For homeowners who want simplicity, affordability, and reliability in one package, then the Funlux 720p HD Wireless Smart Home Day Night Security Surveillance Camera is right up your alley. This compact surveillance camera provides high-quality video and snapshots, along with several other useful tools for monitoring. Setting up the camera is easy. And with its light and small form, you can easily place it anywhere inside your home. It’s wireless with Wi-Fi connectivity so you can always stay connected to your home even when you’re away. Just plug it in, download the Meshare app (available for Android and iOS devices), register an account, add your device, and you’re ready to monitor your home 24/7! Once you’re done, you can enjoy HD live stream and recordings all the time. You can even share the device with family and friends, where you can take and record photos, and download them from the cloud storage which is included for free on the first 60 days upon your purchase of the product. With its extra-wide 115°angle field of view, you can see more space and put your mind at ease. Add to that the camera’s excellent infrared LED night vision feature which provides vivid images even with low to no light. For a camera this small, it has a wide coverage of up to 30 feet for night vision, giving you an owl’s eye at night. Moreover, the Funlux 720p HD Wireless Camera has a pretty nifty motion and sound alert feature which sends out 5 frames of images or snapshots to your phone every time motion and sound are detected. You can also schedule alerts by specific times and dates. This way, you’ll never miss a moment even while you’re away from home. The camera also features two-way audio with built-in mic and speaker that allows you to list and talk, just like an intercom! Among all the remote home monitoring systems in this guide, Funlux offers one of the best and most professional customer service. They don’t require you to pay costly monthly subscription fees. Once you have the equipment, it’s all yours – no surprise commitments! They’re so confident with their product that they’re even offering a 60-day money-back guarantee, complete with a 2-year warranty and lifetime tech support for customers based in the US. It’s hard to deny our love for Netgear’s cutting-edge home security systems, and their Arlo Pro Security System with Siren is just as worthy to be in our top 10 list of the best remote home monitoring systems. This newly released Wi-Fi camera is perfect for both indoor and outdoor use, and also comes with the patented 100% wire-free feature so you can free yourself of power cords. Included in the package are 3 long-lasting, fast-charging rechargeable lithium ion batteries that will take the cost out of uninterrupted monitoring, since you can easily swap them out and power up in seconds without having your cameras offline. You can place the device wherever you want, and from every possible angle. The camera has a 730p video resolution, with a 130° wide-angle field of view. And with its weatherproof design, you’ll have the peace of mind knowing that your device can brave even the harshest weather conditions. It also has great night vision feature so you can continuously monitor your home even in the dark. 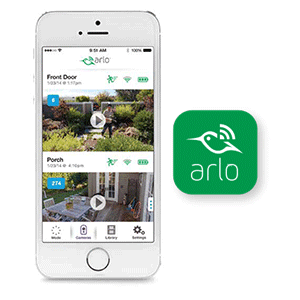 With the free Arlo app, you have complete control of the monitoring system all the time, anywhere you are. Whether you’re using your smartphone, tablet, TV, or desktop computer, monitoring your loved ones and assets is as fast and easy as a click or two. The app is available for Android, iOS, AppleTV, and web browsers so choose whichever is more convenient for you. What makes this system so unique is that, instead of the usual motion and sound detection technology, Arlo Pro has a unique feature called the Smart Siren. This can help you stop crime even before it happens, with its 100+ decibel siren that you can control remotely or when motion is detected. 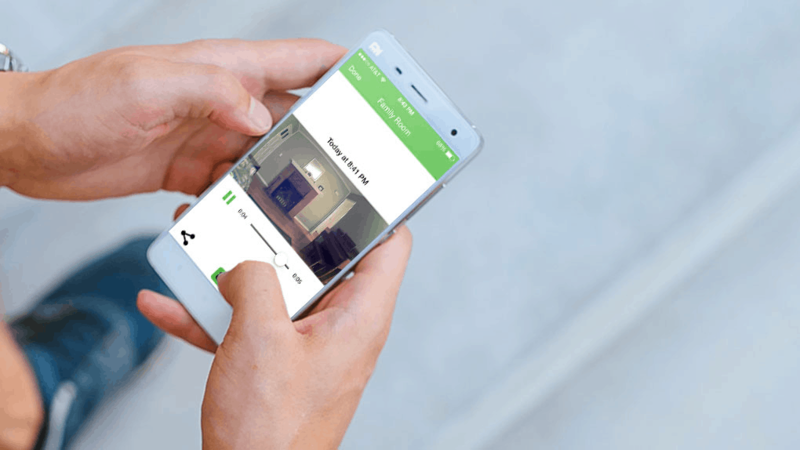 It’s better than your usual capture-the-scene-as-it-happens video clips or snapshots because with Smart Siren, you can immediately send out an alarm to scare off intruders. This is a huge plus for many homeowners and could probably be one of the reasons the system is such a big hit in the market, despite belonging to the more expensive side of the budget spectrum. Apart from the features mentioned above, the Netgear Arlo Pro also has a two-way talk capability, thanks to its built-in microphone and speaker. Other highlights include the 7-day free cloud recording included in the Arlo Basic Plan, which allows you to live stream or view your motion-triggered recorded video completely free of charge. The system also supports local backup with its USB storage. And just like the Netgear Arlo Security System, it works with third-party apps and services like the IFTT, and links with the SmartThings home automation suite. As with any Arlo camera, the Arlo Pro, despite its versatility, still needs a base station system for it to operate properly. Also, despite the free 7-day cloud storage trial, you’ll eventually have to sign up for their cloud subscription plan which comes at an extra cost. So if you have the budget for it, there’s no reason not to get the Arlo Pro for your home. In need of an all-in-one indoor security solution? 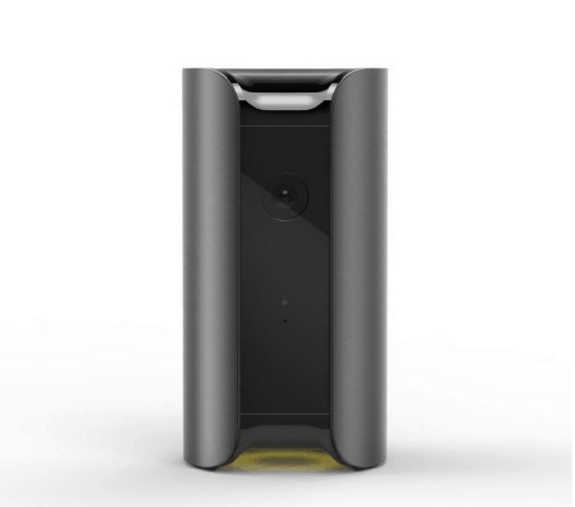 Then the Canary All-in-One Home Security Device might just be the solution to your problem. It’s a complete remote home monitoring system that allows you to control everything from your smartphone. It may not look like your typical security camera but Canary offers one of the highest video quality on the market, with 1080p HD video, a wider-than-usual 147°angle lens, digital zoom, and an integrated night vision feature for crystal-clear recording in the dark. You don’t have to be a rocket scientist to be able to install and set up this device. Despite being one of the smartest security cameras out there, it’s also the simplest. You can place it on a table or shelf, plug it in, connect it to the Internet using your Android or iOS device, and you’re done. That’s it! The camera doesn’t require extra sensors and you only have to download the dedicated app to be able to monitor your home around-the-clock, from anywhere. The thing with the Canary All-in-One Home Security Device is that it’s much more than a security camera. A nice geofencing feature comes built with the camera, which automatically arms or disarms the monitoring system. There’s absolutely no need for you to mess with a keypad or even pull out your phone because Canary senses when you come and go and will automatically change modes. Apart from this, it also protects your home with its innovative 90+ decibel siren – loud enough to scare off any intruder. Of course, there’s still the usual install video alerts that will be sent to your phone but apart from that, you’ll also have instant access to local authorities so they can quickly respond to any untoward incident in your home. 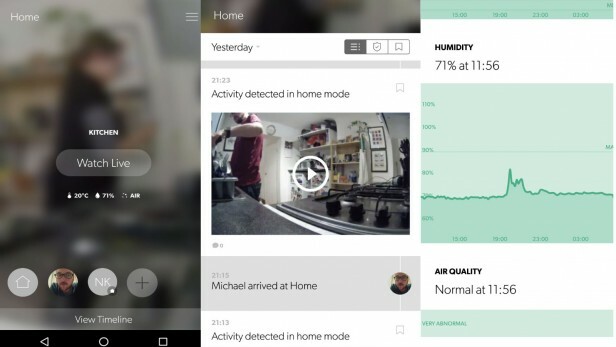 But the real cream of the crop is Canary’s environmental sensors. Because the system can seamlessly interact with Wink smart home devices, it means you can have full control over your home. The system features sleek-looking environment sensors that monitors humidity, heat, and even air quality. That’s right, Canary will let you know if you left your oven on for too long, your sink is flooding, or if there’s a gas leak. It even monitors humidity so you can understand how your home can affect your health. Now that’s true home security! Another particularly appealing offer is that Canary comes with 24 hours of free cloud storage. And with no lengthy contracts or expensive monthly fees necessary, Canary works right out of the box to protect your home. If you think you’re satisfied with the cloud services, you can go for the optional monthly plans which provide extended cloud storage at a fraction of the cost of traditional home monitoring systems. Once again, another home security system from Netgear graces the spotlight, this time with the Arlo Q VMC3040 Q-1080P HD Wired Security Camera with Audio and Cloud Storage. In terms of design, it has little in common with its siblings, though the unique diamond-shaped form gives it an extra oomph in terms of aesthetics. Also, this unit is purely AC powered, unlike the original battery-driven Arlo camera. 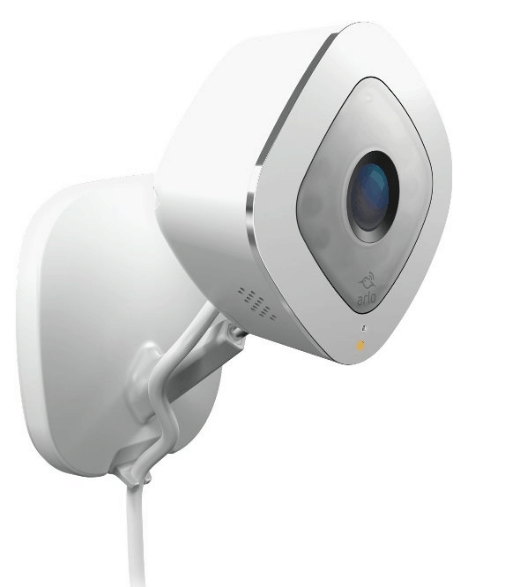 However, just like its predecessors, the Arlo Q has top-notch 1080p video quality, wide 130° viewing angle, superior night vision feature, reliable motion and audio sensing technology, two-way talk feature, and flexible scheduling and intuitive user interface. It can be used both as an indoor and outdoor security camera, with a weatherproof design that can withstand harsh weather conditions, rain or shine. The Netgear Arlo Q may be more expensive than other models of this type, but the features that come with it will definitely give you a run for your money. Top it with its generous 7-day free cloud subscription plan and you’ll get the past week’s motion-triggered recordings at no cost for the lifetime of the unit. You can view, share, and download images and video clips for free – no contract necessary. This more than justifies the unit’s relatively high price, right? And if you wish to upgrade your plan and connect more cameras, you can do so any time with the optional Continuous Video Recording (CVR) feature that lets you keep your 24/7 recordings in the cloud, for the ultimate peace of mind. Now that’s one tough wireless security camera to beat! Last but definitely not the least is Blink’s very own Home Security Camera System with Motion Detection, HD Video, Battery and Cloud Storage for Smartphones. In terms of usability, this battery-powered wireless security camera is one of the best there is. It’s simple and easy to set up and is a great choice for renters and homeowners. With its small and light design, it’s easy to place and move within your home. You can create a system that will cover your windows and entryways, in a room where you can monitor your kids, or even in the garage where you can keep a watchful eye on your driveway. The Blink Home Security Camera System has a pretty good 720p video resolution. Although acceptable, the daytime video is only average. The camera also has a night vision feature but just like daytime video recording, footages taken at night look a little underpowered. That said, the overall quality of the images and videos are still pretty good, as long as its within 20 feet from the camera. Get past 30 feet, however, and the faces get a little blurry, especially when the light isn’t bright enough. Perhaps the real issue here is that at nighttime when there are moving objects, they sometimes appear as indiscernible light blobs, making identification of an object or person impossible. On the upside, Blink is thoughtfully designed to make monitoring your home easy and accessible wherever you go. It comes with a dedicated mobile app on Android and iOS which you can use to control the cameras. 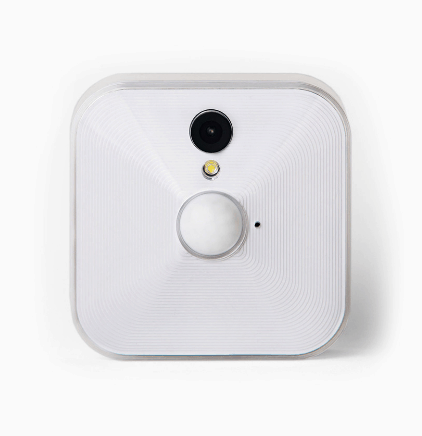 To deliver instant home insight, the camera has motion and temperature sensors. When unusual movements or temperature is detected, Blink will immediately send you a notification via phone and will let you see exactly what cause the alert. From there, you can decide how to respond via the Live View mode found in the app. Sadly though, the camera only records video when it detects motion, which means there isn’t a continuous recording feature. You can use the mobile app to set the length of video clips and you can download the clips to your phone for offline viewing. The good news is that the system come with a two-way talk capability and has the capacity to integrate with other home automation devices. Moreover, it provides you with free cloud storage up to 1GB capacity. Sadly, there aren’t any paid plans available for this system yet so there’s no way to upgrade to a much higher storage capacity. The system comes with a 1-year warranty, with no monthly fees. So once you purchase the unit, it’s all yours. It’s a pretty good deal, but it doesn’t come close to the other best-sellers in this list. And there you have it, guys. The 10 best remote home monitoring systems for 2018 so far. In terms of overall video performance, there’s no doubt that the Nest Cam Indoor Security Camera is the real MVP. This system passed our daytime and nighttime video tests, with sharp and richly detailed recordings and little to no noise. In terms of features, however, the Canary All-in-One Home Security Device emerges at the top spot, especially with its cutting-edge environmental sensors and 90dB siren. As for affordability, the Blink Home Security Camera System gives the best value for your money, although the issues with distortion and the lack of option to upgrade to a higher plan can put off some potential customers. That aside, the free cloud storage is an appealing offer that will have you save several bucks from costly monthly subscription fees. Generally, each of the products in this guide has their own set of strengths and weaknesses that can affect a person’s buying decision. In fact, none of the products here are perfect in all aspects. We hope that you can use this information to help you find the best remote home monitoring system that best fits your needs. As always, feel free to let us know if we missed something or made a mistake. Thank you and good luck!